In the five years after World War I ended, the Yankees and Red Sox made nine major player transactions. The Yankees came out of most of those deals so far ahead of the Red Sox that many Boston fans and sports writers were sure Red Sox owner Harry Frazee also had an ownership stake in New York’s franchise. Just before Christmas in 1921, Frazee made yet another deal with New York. A total of seven players were involved in the transaction including each team’s starting shortstop. Boston got New York’s Roger Peckinpaugh and then quickly traded him to Washington for another future Yankee, Jumpin Joe Dugan. New York got Everett Scott from the Red Sox. 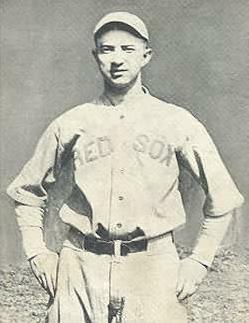 Scott had started at short for the 1915, ’16 and ’18 Red Sox World Championship teams. In all, he played for Boston for eight seasons, averaging .246 during that span. He absolutely loved playing in Boston and I do mean “loved playing,” because at the time of his trade to new York, he had played in a then Major League record of 830 consecutive games. That streak would not end until May 5 1925, during Scott’s fourth and final season with New York, when Yankee Manager, Miller Huggins decided his shortstop needed to rest a sore back. At the time he had played in 1,307 consecutive games. Just a couple weeks later, Scott’s Yankee teammate, a young first baseman named Lou Gehrig began a consecutive game playing streak that would eventually overwhelm Scott’s achievement. The player they called “Deacon” was not much of a hitter but he was one of baseball’s best defensive shortstops during his day. And although he didn’t hit for average, Scott barely struck out, making him a valuable hit-and-run weapon. He was also very smart and worked very hard at his craft. That’s probably why Miller Huggins made the guy a Yankee Captain. Old Everett added a fourth World Series ring to his collection in 1923, as a key member of the first-ever Yankee team to win the Fall Classic. In all he played thirteen big league seasons in five different uniforms and hit .249 lifetime. He was born on November 19, 1892 in Bluffton, IN and died almost 68 years later, in nearby Ft Wayne.